Description:- TShirtPrinting.net, is your number one destination for screen printing your personalised T shirts, hooded tops, sweatshirts and workwear. Here at TshirtPrinting.net we have over twenty years experience in the screen printing industry and take pride in offering an honest, easy to understand way of doing business. We believe that you, our customer, are searching for someone to fulfil your printing needs without stress and with your satisfaction being our main aim. If you are looking for bespoke printed T shirts for your workwear, team or you are developing a fashion collection we can offer advice, discuss the best options in terms of the blank garments and make the whole process easy and painless. To speak to a real person for friendly advice or to place your order please call us on 0800 046 7633.
Review:- The t-shirt is fantastic. I love the colour and the cheeky monkey on the front. The t-shirt material is very good quality and washes well. The print is bright, no cracks showing what so ever as you find with printed t-shirts. I’ve washed it a few times and it’s still as bright and as colourful as when I first got it. I got a medium and it is a great fit, very comfortable, not too snug and not too loose. We have gotten t-shirts printed for many a hen night and I wish I had known about tshirtprinting.net before now. I would definetly have used them and I will be in the furture. All other ones I have had done are rubbish t-shirts and the print starts to come off half way through the night, even before you have a few too many shandy’s. All in all I would highly recommend tshirtprinting.net for all your printed clothing needs. Thank you to tshirtprinting.net for sending me this t-shirt in exchange for an honest review. 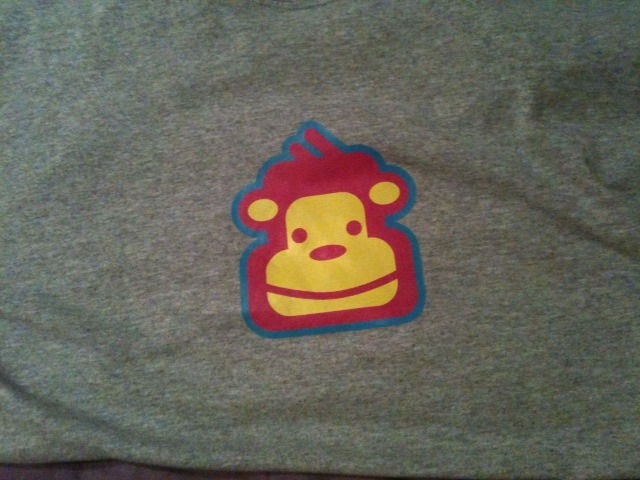 I always like the tshirts that have happy face on them .. they became really popular in 90's ..this one is quite unique as it has got monkey face on it ..